between an employee and independent contractor, as well as exempt vs. non-exempt status. If I only use independent contractors, and I don’t have any employees, do I need labor law posters? 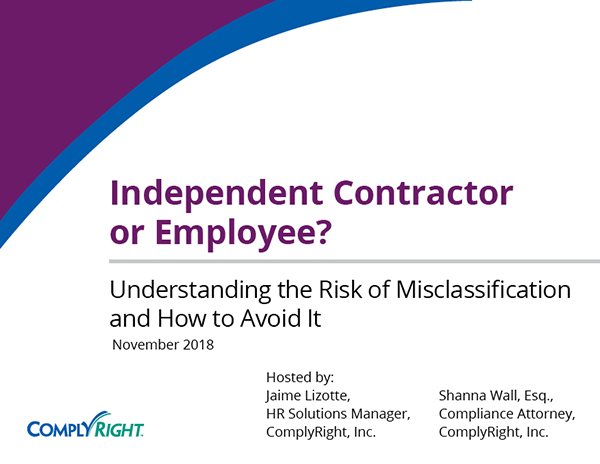 If you have no paid employees — and all contractors are classified correctly and there’s no chance they are employees in the eyes of the law — then you do not need to display labor law postings. We’re using freelancers right now but don’t have signed agreements. Should we ask them to sign agreements now after the fact? Yes, absolutely. Using a written agreement can help you avoid legal disputes because it provides a written description of the services the freelancers will perform, when these are to be performed, and how much they will be paid. A written agreement can also help establish that your freelancers are independent contractors. In the future, I would recommend not beginning any work with contractors, temps, freelancers, etc., until after an agreement is signed. Do I have to pay my hourly/non-exempt employees for breaks? Good question. State laws vary, so you’ll want to check local regulations. But on a federal level, you do not need to pay non-exempt employees for breaks of 20 minutes or more. And you can require them to clock out. But if a break is less than 20 minutes, you are required to pay. And one final note here … federal law does not require you to give breaks to employees. So you determine your policy on breaks. But again, check your local laws. Can I fire someone for refusing to work overtime? Generally, employers have the right to require employees to work overtime to meet productivity goals or finish projects. But as a courtesy, I would recommend giving as much notice as possible. If an employee refuses — at-will employment typically allows employers to discharge employees for any reason, including refusal to work overtime. What is the rule you are referring to (2016)? Yes, so in the webinar I mentioned a new rule that the DOL tried to implement but was halted by the courts at the last minute so it never took effect. That rule raised the minimum salary requirement from $455 a week to $913 a week. Because that rule never took effect, the salary requirement currently remains at $455 a week. Remember, that is just the first prong to qualifying for an exemption. Where can we find a duties test for exemptions? You can find the duties tests in the actual FLSA regulations. The FLSA can be found in Title 29 of the Code of Federal Regulations, and the duties tests specifically can be found in Part 541 of Title 29. Is it ever OK to have employees who share the same title as exempt vs. non-exempt simply because of the fact that they don’t have a degree but were hired to do the same job? Remember here that job titles have nothing to do with classifications. 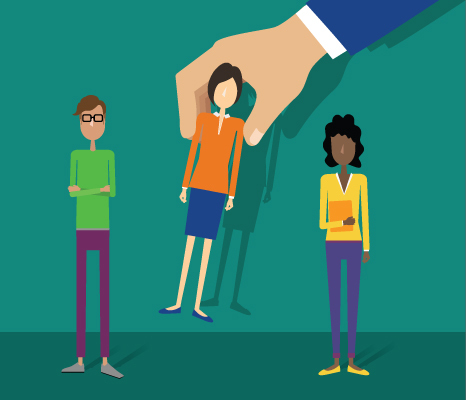 The deciding factors are based on the duties tests – again what the employee actually does. So theoretically two people with the same job title can have two different classifications depending on what they actually do and how much they are paid. As far as the degree goes, that part of the job duties test really only comes into play in the learned professional exemption. Based on this question, I can’t tell which exemption the person asking the question was referring to but again for the learned professional exemption, advanced knowledge, which is typically acquired by obtaining a degree from an accredited institution, is required to qualify under the learned professional exemption. Is a graphic designer working on brochures exempt? Yes, so I saw a lot of specific questions like this one come in — questions that ask about specific jobs, whether they are exempt or not. Typically, in our Q & A sessions, we don’t address specific questions like these because we want to focus on the questions that can apply to most of the listeners. But I do want to address this one because here is a good example of how you can’t make a determination based on a job title. Of course, this person did give a bit more detail that the graphic designer is working on brochures, but it is still not enough information to make a final determination. Remember, for creative professionals, the primary duty must be the performance of work requiring invention, imagination, originality or talent in a recognized field of artistic or creative endeavor. This does include specifically graphic arts. However, does this graphic designer have artistic freedom to create the brochures or is this person simply told what the brochure should look like and how to do it? This exemption has to be made on a case-by-case basis, and the determination depends on the extent of the invention, imagination, originality or talent that is used by the individual. So again, as you can see, you can’t just make a determination based on job title alone. One last thing before we wrap up this podcast — I know that these exemptions and duties tests are confusing and complicated and you really have to evaluate your employees each individually. If you have any question as to what the person’s classification should be, I highly recommend that you seek the advice of an employment attorney. Of if you have a person that it’s really too close to call and you want to be extra-cautious, you can always just make that person non-exempt. There is no penalty for making an employee non-exempt when he/she could be exempt, but there could be great risk if you misclassify someone as exempt when he/she should be exempt.